Over recent years, quite a number of valuable horses have developed acute infection within the lung and chest commonly referred to as 'travel sickness' or 'shipping disease'. Horses that have raced or been subjected to strenuous exercise immediately prior to long distance travelling are particularly prone to developing pleuropneumonia, which if not recognised and treated early, is invariably debilitating and may be fatal. Cause Top Low grade viral infection, breathing contaminated air in poorly ventilated transports and the stress of travel appear to be the main underlying causes. 'Short tying' the head can lead to the spread of bacteria from the nose and mouth area into the deeper parts of the respiratory tract, predisposing the horse to travel sickness. The risk of travel sickness is increased if horses are unable to put their heads down to drain normal respiratory secretions. 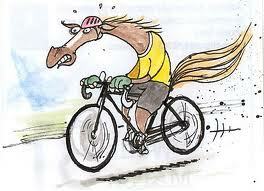 Travel sickness is also a problem in horses travelled by air over long distances. Studies have shown that general airborne contamination is highest at the rear of the aircraft and transports, and horses travelling at the rear are most likely to develop the condition. Transporting horses which are suffering from underlying viral disease, or are tired and dehydrated after racing or competition, increases the risk. Dusty feed and hay containing bacterial germs and moulds, and breathing in dust from roads, results in inhaled contamination, which overloads the lungs' defence system. Unfortunately, many modern 'streamlined' floats and horse transports are often poorly ventilated. Symptoms Top It is important to watch for and recognise the tell-tale signs early, especially during the few days following a long trip. pant in shallow, rapid breaths. Early signs may be confused with colic, as horses resist moving, stand with the front legs apart, and paw the ground. As the condition worsens, the horse may turn to look at its painful chest. Immediate veterinary advice should be obtained. Unfortunately, once pleuropneumonia worsens, it is difficult to treat, and can result in death within 3-5 days. Always ensure that horses are cooled down, and given a drink before long distance travel. In very tired, dehydrated or stressed horses, long distance travel of over 12 hours duration should be delayed until they recover, preferably at least overnight. Ensure ventilation is sufficient to keep air flowing without causing chills. An adequate rate of air change is important in large transports carrying a number of horses over long distances. Provide dampened feed or pellets to reduce dust and airborne contamination. Lightly dampen hay, in particular, by wrapping a biscuit of hay in a wet chaff bag for 2-4 hours to reduce dust and other airborne contamination. This will increase palatability of hay and provide additional moisture during long trips. Locate feeders below chest bar height. Do not tie the head too short - give the horse as much space as possible to feel comfortable and be able to put its head down. Stallion dividers may be required to prevent horses squabbling during transport. Avoid transporting horses suffering from respiratory disease. If a horse has symptoms, do not transport it as it may infect others during the trip. Ensure the trailer is in good condition and level on the towbar. Drive steadily and smoothly. Keep the back flap down to reduce intake of swirling dust on dirt roads. Stop every 3-4 hours and open the trailer doors. If possible, unload and allow the horse(s) to walk around, or preferably graze or feed with the head down for at least 15-20 minutes. Provide access to drinking water at rest stops. A 60ml dose of Recharge over the tongue will replace electrolytes and stimulate drinking. If a horse has competed or raced hard, give it a day off after a long trip. Turning the horse into a grassy green paddock to graze with its head down for a few hours, or putting dampened feed in a bin at floor level, will encourage drainage of the respiratory system. After travelling a horse over a long distance, keep a careful watch for loss of appetite, depression, fever and obvious discomfort for the first few days. It is a good idea to monitor the horse's temperature morning and night for at least 3 days after long trips, and seek vet advice if the temperature is elevated (the normal body temperature of an adult horse is 36.5-38.5°C). What is a PONY ? A horse of a small breed. 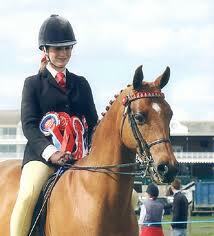 A pony is a breed of horse which has a number of distinct traits, most notably a small size. Numerous pony breeds can be found all over the world, and some well known representatives of this equine group include Shetland, Welsh, and Connemara ponies. Just like their larger relatives, ponies have been used for work, sport, and pleasure for thousands of years, and they are incredibly diverse creatures. A pony is not merely a small horse. There are several distinct physical differences between horses and ponies which make the two easy to distinguish. Ponies tend to very stocky, with thick bones, wide chests, and small heads. Their manes, tails, and coats are often thicker than those of horses, perhaps because many pony breeds evolved in colder climates where a thick layer of insulation would be vital. Ponies are also incredibly strong for their size, thanks to their muscular bodies. A mature pony can sometimes pull the same weight as a draft horse, for example, and many ponies are capable of carrying adult riders. Pound for pound, ponies are much stronger than horses. They are also known for being extremely hardy, and tolerant of a wide range of conditions including extreme cold. The pony is also famous for being extremely intelligent, and sometimes a bit stubborn. Sizes and Scales:Ponies are 14.2 hands (abbreviated hh) (1.47 m) at the withers or smaller, while a horse is anything taller than 14.2 hh at the withers. What's in a Name? The term "pony" can be used generally for any small horse, regardless of its actual measurements. It is interesting to note, however, that some equine breeds are not considered ponies, even if they are under 14.2 hh, because of their fiery temperament. All For Show: For showing purposes, ponies are grouped into small, medium, and large sizes. Small ponies are 12.2 hh and under, medium ponies are over 12.2 but no taller than 13.2 hh (1.27 to 1.37 m), and large ponies are over 13.2 hh but no taller than 14.2 hh (1.37 to 1.47 m). Note, however, that miniature horses are not the same as ponies. A miniature horse is in fact much smaller, required to be no taller than 8.2 hh (86cm) at the withers. There are also miniature pony breeds. Wild Ponies?There are several wild breeds of pony, and these have often been captured and bred for various purposes, especially in Britain and Ireland. These wild breeds along with domestic breeds were used as "pit ponies" hauling loads of coal up from the mines, for freight transport, as children's mounts and for entertainment, and later as competitors and performers in their own right. They were also ridden (and continue to be ridden) by adults, as ponies are usually very strong. Ponies are often said to be mean, untrustworthy, spooky or devious. Properly trained ponies can be gentle, and are appropriate mounts for children who are learning to ride. The Riding Pony was developed in the United Kingdom, and was such a success that it is now bred all over the world. They are excellent show ponies. The breed is an extremely elegant animal, more like a small horse than a pony. It has a small head and small, neat ears. They are compact, with sloping shoulders and a narrow front. Their feet are tough and they possess strong limbs. They are well-proportioned with comfortable gaits and free-flowing movement. Shetland ponies, also known as shelts, are small (on average up to 42 inches to the wither) but strong for their size. The Shetland Pony originated from the Shetland Islands - North East of Scotland. Versatility in a Pony: The United States mid-west coal mines also imported some of these animals. The Shetland Pony Stud Book Society was started in 1890 to maintain purity and encourage high-quality animals. In 1956, the Shetland Islands Premium Stallion Scheme was formed to subsidize high-quality registered stallions to improve the breeding stock. Today, Shetlands are used as children's ponies and are also featured in the Shetland Pony Grand National, galloping around the course with their young jockeys. We have labeled all of our halters and bridles to fit the typical pony of the size mentioned. These are guidelines only! Sometimes an animal will have a smaller or bigger head for his size, plus different breeds have different shaped heads. For example, Welsh ponies usually have small muzzles and broad foreheads. Stallions will have much larger jowels as will Arabians or part Arabs. 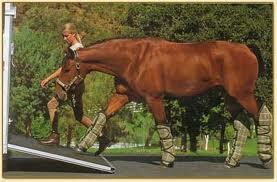 There are only two kinds of horses.... those that have laminitis and those that could someday get it! So what is laminitis and how do horses get it? Put simply, laminits is the inflamation of the sensitive laminar corium in the hoof, causing a breakdown of the bond between the hoof wall and the coffin bone. Severe cases are commonly known as founder and major causes are by eating sugar rich grasses, but it can also be caused by concussion of the hooves on hard surfaces, over-eating grain, infection from retaining afterbirth, excessive weight bearing on one leg, stress, vaccinations and medications. There are many good texts giving much greater detail on the causes and treatments, so if you own a horse, you should be aware of how this condition occurs and how to keep your horse from suffering it. One such book with an excellent chapter on laminitis is The Sound Hoof - Horse Health from the Ground up by Lisa Simons Lancaster (read a full review). You can purchase this book from www.tallgrasspublishers.com. Reluctance to move freely (especially on hard/rough surfaces). Blood stains visible in the white line or hoof wall. Pulse and respiration may be elevated due to pain. When moving, prefers to canter rather than trot if given a choice. Feet are off balance - may have long toes, high heels or both. Moves forward soundly but takes slightly shorter than normal strides. Sound on soft terrain but may limp or stumble on hard or rocky ground. Sole bruising and a stretched white line (in some horses, by the time you see this they have been compromised for quite some time). Photo: If your horse's hooves have numerous stress rings like this one, it probably indicates repeated episodes of sub clinical laminitis. Shifting weigh tfrom foot to foot (swaying side to side). Standing with front legs stretched out, back arched, trying to lean back to get weight off toes. When asked to turn in a tight area like a stall or narrow barn aisle the horse rocks backwards onto haunches, lifts head up and lurches around because it hurts to turn the feet. Usually several of these signs will appear together or appear over the course of a few days. All of the signs need to be evaluated in context. No single indicator would be diagnostic for laminitis. If you suspect your horse has laminitis or founder then do your research, ask many opinions from varied sources (natural hoof care practitioners, vets, farriers) and comminicate with others who have successfully rehabilitated a founderd horse or pony. Then DO someting about it - just hoping that early signs will go away is leading to a severe case which is more painful for your horse and your pocket! Do you have hooves trimmed regularly? (ie: every 4 weeks - not 8, 10 or 12) to maintain good hoof balance and health. What is the diet? Grains, lucernes, rich grass or a fresh flush of grass all cause laminitic attacks. What stresses does your horse endure? Travelling, competing, over training, illness, vaccinations, de-worming and medicating can all be triggers for laminitis. Because laminitis is a "whole horse disorder" a holistic approach works well to identify and correct the root cause. Be especially vigilant as spring grasses are starting to emerge. Restrict access to grass during the later part of the day and at night, and keep feeding plenty of hay so your horse doesn't feel the need to gorge on toxic grass. Carola Adolf's articles on Laminits. FABULOUS ONLINE VIDEOS ALL HORSE OWNERS NEED TO SEE – learn more about the dangers of over-feeding your horse and how to tell if they are overweight. Click this link to Fran Jurga’s Hoofblog to read more about how we inadvertently overfeed our horses and cases of laminitis are rising as a consequence – the videos are each about 7-9 minutes long. Amazing Founder Rehabilitation through hoof trimming and wholistic care. Most vets and horse owners consider a severe case of laminitis to be a death sentence. Some think it’s too much hard work and expense for them and too much pain for the horse or pony to endure. But why should we give up on those wonderful creatures who have given us so much? Previously it was thought that a foundered pony or horse couldn’t ever return to soundness and therefore usefulness – I was one of them. Since meeting Glynn and being involved in his rehabilitation, I’ve discovered otherwise. With a good natural hoof trim on a regular basis and changes to a more natural diet free of rich grasses, a horse can grow a whole new hoof (or 4). This re-aligns the pedal bone and the horse becomes sound and able to perform again. In the process the owner learns how to care for the horse so laminitis doesn’t re-occur. Everyone is a winner! Here is the story of Glynn and his recovery. Glynn is a 22 year old Welsh Section A stallion and was a show ring champion in NSW in his younger days. His move to Tasmania last year onto richer grass, and in-frequent hoof care caused laminitis which was so severe that most vets would have recommended euthanasia. All four pedal bones had rotated through his soles causing open wounds and extreme lameness. Glynn's founder stance prior to the first trim. Cynthia was called for advice in February 2005 and fortunately, respected QLD Hoof Trimmer, Peter Laidley was in Tasmania for a workshop so was able to do the initial trim and prescribe a course of treatment. Trims were continued by Cynthia along with daily love and care from his owner, followed by another check up from Peter in May. In the space of seven months he went from being barely able to move, to trotting and cantering freely on grass. He is now able to handle walking on gravel and his hooves will continue to improve and toughen up now that they are back in shape. *A natural trim every week for 8 weeks, then every fortnight for the next 6 weeks & now every 3 weeks. * Initial bandaging of the front hoof wounds to keep honey in and dirt out until the wounds were healed (3 months). * Painkillers to keep spirits up and encourage some movement (gradually phased out after 4 weeks). * Confinement away from grass in a large stock yard on soft footing (wood chips & straw then some pea sized gravel was added in wet areas). Free choice average quality grass hay plus oaten chaff with supplements and a small amount of pellets (Hygain Ice recommended) and a few vegetables for variety. Once the hooves have regained a sound shape, a small amount of grass is allowed daily (1 hour of grazing with a muzzle on). Once the grass dries off, more grazing can be gradually offered. Right after the first trim and padded hooves, Glynn was able to get relief and stand comfortably. The front hooves prior to the first trim - extremely high heels contributed to rotated pedal bones through the sole. The worst front hoof showing the pedal bone through the sole. Polystyrene pads initially provided support and relief. 9 months later the worst front hoof has regained a sound structure. The hind hoof also showing a wound from the rotated pedal bone and blood in the white line. A hind hoof half way through treatment showing the new and old growth. The hind hoof 9 months later. The front hoof is getting closer to its ideal shape 9 months later. Glynn looking and feeling great 9 months later. Glynn was trimmed by Peter Laidley for his 1 year anniversary trim and shows his appreciation with a pony kiss. His hinds are looking fantastic. His front hooves still have some recovery to do but are so much better. Glynn looking good (but still a bit cresty) in Feb. 2006 exactly 12 months after his first rehab trim. Horses evolved to eat small amounts of grasses, herbs and minerals almost constantly throughout the day. They covered many miles to reach water and lived in small herds of varied ages and sexes. Does this sound like the modern horse? Not really - their involvement with humans has necessitated their restriction and artificial feeding for ease of use as a working animal. But today the majority of horses are used for pleasure and that pleasure need not be all ours. If we want a happy, healthy horse to provide many years of companionship then we can change our ways to suit their nature. Many new ideas are replacing traditional methods of horsemanship and health care with hoof care and feeding now the focus. Natural Hoof Care practitioners and forage researchers have discovered that horses cannot be fed like cows – on high sugar grasses that maximise beef and milk production. To do so, compromises the health of our horses by causing laminitis as horses become more carbohydrate intolerant – commonly called ‘good doers’. 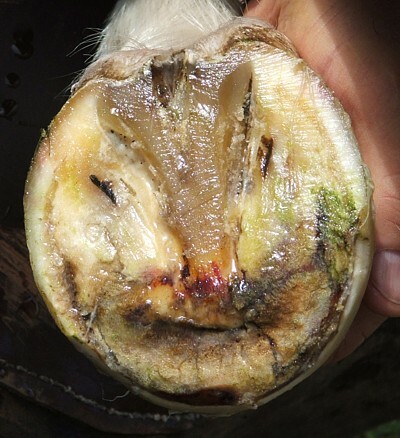 When horses eat high sugar grass it causes a toxic reaction in the hind gut which then affects the connection between hoof wall and laminae (sensitive internal structure). This causes common hoof ailments such as abscesses, seedy toe, white line disease and deformed, shallow, sensitive hooves. With a little thought and planning, better management and feeding practices can change all of this. Ensure grass hay is fed as the main diet, along with free choice minerals and salt. Try to feed as far from the water as possible to encourage movement. Give your horse room to move by fencing a 10–30m wide track around your pasture which makes a long, thin paddock and restricts grass intake. Restrict grass intake appropriately for each horse – most will need to be kept off grass during the evening when the grass sugars are highest. Some horses may only be able to tolerate a couple of hours in the very early morning, especially in spring. Some ‘good doers’ will need to wear a grazing muzzle some of the time to remain with the herd. It’s not comfortable for them to wear a muzzle all the time and colic may result if they don't get enough bulk food (such as hay). It is reccommended to remove the muzzle and horse/pony from the grass and feed hay overnight. Some good doers will need to have their ‘sugar rich’ hay soaked for a few hours to lower the sugar content. Rich hay is usually cut from rye grass & clover pastures designed for fattening cattle. Avoid feeding grain unless your horse is receiving enough additional exercise to utilise the energy such as racehorses, endurance and performance horses. Broodmares, foals and young horses may need some grains and legumes (lucerne) to provide additional protein and calcium. All other horses will gain or maintain weight, safely on free choice hay. Just recently, after years of research, I have finally been able to give a name to what my wife and I have been living with for years. It's an affliction, for sure, which when undiagnosed and misunderstood can devastate and literally tear a family apart. Very little is known about O.C.E.A.N. Syndrome. But it is my hope this article will generate interest from researchers involved in the equine and psychological sciences. You will, no doubt, begin to identify similar symptoms in your own family and hopefully now be able to cope. OBSESSIVE COMPULSIVE EQUINE ATTACHMENT NEUROSIS SYNDROME O.C.E.A.N.S) is usually found in the female and can manifest itself anytime from birth to the golden years. Symptoms may appear any time and may even go dormant in the late teens, but the syndrome frequently re-emerges in later years. Symptoms vary widely in both number and degree of severity. Allow me to share some examples which are most prominent in our home. 11. Will pick a horse's nose, and call it cleaning, but becomes verbally violent when her husband picks his. 12. Can sit through a four-hour session of a ground work clinic, but unable to make it through a half-hour episode of Cops. 1. Must come to terms with the fact there is no cure, and only slightly effective treatments. The syndrome may be genetic or caused by the inhaling of manure particles which, I propose, have an adverse effect on female hormones. 2. Must adjust the family budget to include equine items - hay,veterinarian services, farrier services, riding boots and clothes, supplements, tack, equine masseuse and acupuncturist - as well as the (mandatory) equine spiritual guide, etc. Once you have identified a monthly figure, never look at it again. Doing so will cause tightness in your chest, nausea and occasional diarrhea. 4. Must form a support group. You need to know you're not alone - and there's no shame in admitting your wife has a problem. My support group, for instance, involves men who truly enjoy Harley Davidsons, four-day weekends and lots of scotch. Most times, she is unaware that I am even gone, until the precise moment she needs help getting a 50-pound bag of grain out of the truck. Whoever thinks horse riding and care isn't excercise never owned a horse! Between the shoveling and the grooming and the training, you're burning up a lot of calories-- for example, riding at a trot burns more calories than a brisk walk!